​​​​​​​​​​​​​​​​​​​​​​​​​​​​​​​​​​​​​​​​​​Marshfield Labs is one of the largest full-service private practice laboratory systems in the nation and a leader in laboratory medicine. As part of the Marshfield Clinic Health System, we benefit from the infrastructure, expertise and reputation of a large, multi-specialty group practice and premier research organization. Our pathologists, clinical scientists and laboratory personnel provide subspecialty expertise in all facets of laboratory medicine and pathology, and are available for consultation in support of our laboratory offerings. Marshfield Labs' Reference Laboratory was established in 1973 to serve the needs of physicians and patients throughout Wisconsin, Upper Michigan, and Eastern Minnesota. Today, we have expanded to multiple lab locations throughout the Midwest offering Veterinary, Research and Toxicology testing to clients nationwide. 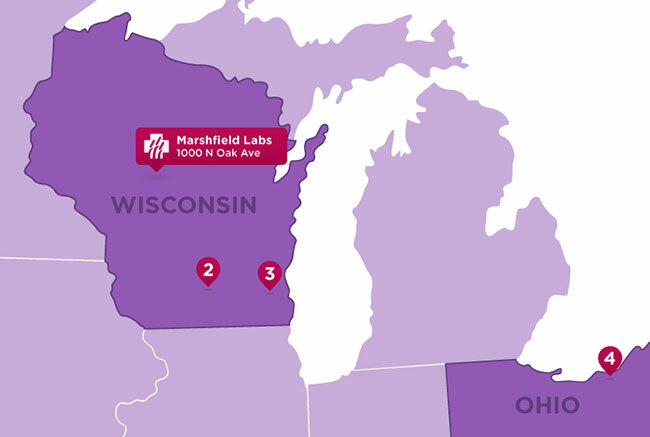 ​Marshfield Labs has multiple locations throughout the Midwest. We serve clients nation-wide through our convenient courier service.